ATLANTA (AP) — Talk about a tough day. The Las Vegas Aces lost two games — one on the court, another for refusing to take the court. The WNBA ruled the Aces must forfeit last weekend’s contest against Washington, which was called off when the Las Vegas players decided not to play because of concerns about their health and safety after 26 hours of travel . A few hours after the league office handed down its decision, the fired-up Aces faced the second-place Atlanta Dream on Tuesday night. Las Vegas started strong and led much of the way before fading down the stretch, losing 109-100 for a double-setback that largely snuffed out any hopes of making the playoffs. Just like that, the Aces record went from 12-15 to 12-17, leaving the team 2 1/2 games behind Dallas for the final playoff spot with only five games left in the regular season. No one expressed regret about taking a stand in Washington last Friday after flight delays and cancellations turned what should have been a 4 1/2-hour flight across the country into a grueling, frustrating ordeal that took a detour through Texas and wound up lasting more than a day — more in line with a trip to the other side of the world, sparking a national debate over the sacrifices female athletes must endure in a financially challenged league of their own. Atlanta coach Nicki Collen was expecting the Aces to play with a lot of energy on the heels of the WNBA’s ruling. Indeed, Las Vegas raced to a 9-2 lead in the opening minutes, forcing Collen to call a quick timeout. The Dream stymied the momentum, setting up a back-and-forth game the Aces led with less than six minutes remaining. But even after Atlanta lost star Angel McCoughtry to a knee injury, Las Vegas couldn’t hang on. The Dream closed the game on a 16-6 spurt, wrapping up their spot in the postseason — most likely as the No. 2 seed behind Seattle . There have been only a handful of instances over the past few decades in which major-league teams had to forfeit a game. Most of those occurred because of fan involvement, notably the Chicago White Sox’s infamous Disco Demolition Night in 1979 when the field was so damaged the second game of a doubleheader could not be played. The WNBA said it “worked extensively” with both teams to find a “workable solution,” but there wasn’t enough time left in the season to find a date in which the arena was available and would be fair to both teams. The league noted that it delayed the start of the game by an hour to 8 p.m. — about four hours after the Aces finally arrived at their hotel — to give Las Vegas as much time as possible to get ready for tipoff. It was the first forfeit in the league’s 21-year history. Travel delays are nothing new for WNBA teams, which aren’t allowed to fly charter because of the cost and the competitive advantage it could give some teams willing to spend the money. The Aces were criticized by some — including Washington coach Mike Thibault — for not playing even though they were able to make it to the nation’s capital with a few hours to spare. Others sympathized with their plight, pointing out how male big-league athletes get to travel on spacious charters without all the hassles of commercial flights. There could be a silver lining to missing the playoffs. Under the WNBA’s lottery system, the Las Vegas franchise would have a shot at landing one of the top picks in the draft for a third year in a row. The first-year team, which moved from San Antonio before the season, got Wilson with the top selection in the 2018 draft. The 6-foot-4 forward is averaging more than 20 points a game, quickly becoming the face of the franchise and a huge cornerstone to build around in future drafts. In 2017, San Antonio drafted Kelsey Plum with the No. 1 pick. If nothing else, the forfeit could lead to improvements in the way WNBA players get from one city to another. Their union hopes the league will take up its offer to form a group that will develop scheduling and travel guidelines. 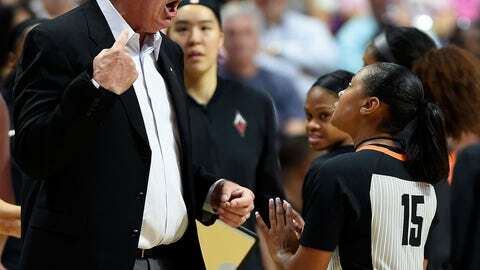 Aces coach Bill Laimbeer just wants to move on.